I've heard lots of reports about dead fish all over the beaches from Gasparilla south and the red tide definitely moved into the northern part of Pine Island sound in the last week. It fortunately wasn't all that bad and there were only scattered dead mullet around the Cabbage Key flats and Patricio Island. At the same time, I didn't see any live mullet or other baitfish on the big flats north of Pineland where the reds and trout have really been hitting. Those flats were empty when I was there two days ago but there were no dead fish, fortunately. The good news is that Matlacha Pass has been mostly unaffected. I've seen more snook over the past few days than I have all month. Not much luck catching any since most of my anglers have been throwing flies. 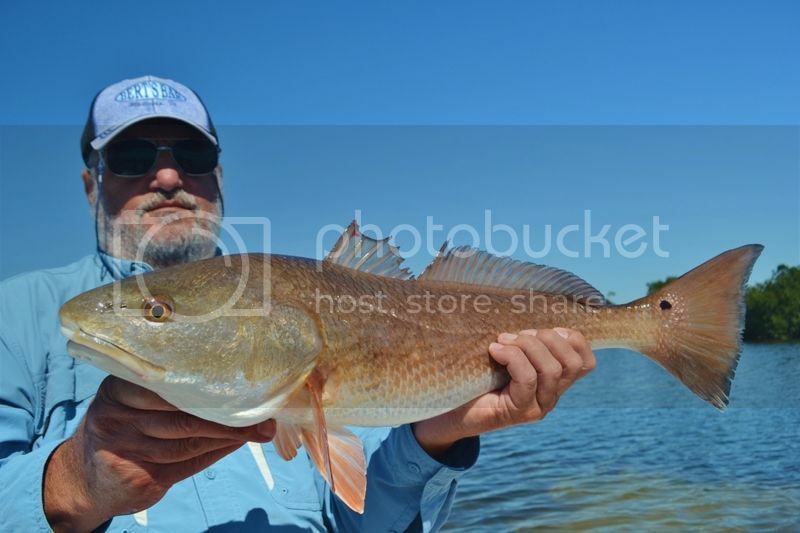 The redfish are a lot more cooperative on just about any live bait and Gulps (of course.) Here's one my angler Don Atkinson from Ohio caught by sightcasting with a Clouser fly near Jug Creek. Today's wind and the approaching front should hopefully push all that red tide out of here. It was honking out of the south at over 20 knots and you could have surfed south of the Matlacha Bridge. Looks like I'll be off the water until the weekend. Has anyone been out lately to see if the Red Tide has dissipated? I talked to a guy I work with who went out around the time of your last post and he said that he saw a bunch of dead mullet down south too. I'm thinking about trying to make it out this weekend and am curious to see if things have cleared up. I haven't been out to the Sound recently but Matlacha Pass is in great shape. Tons of trout and more than enough redfish, too. We caught this one yesterday near Jug Creek on a Gulp Shrimp. 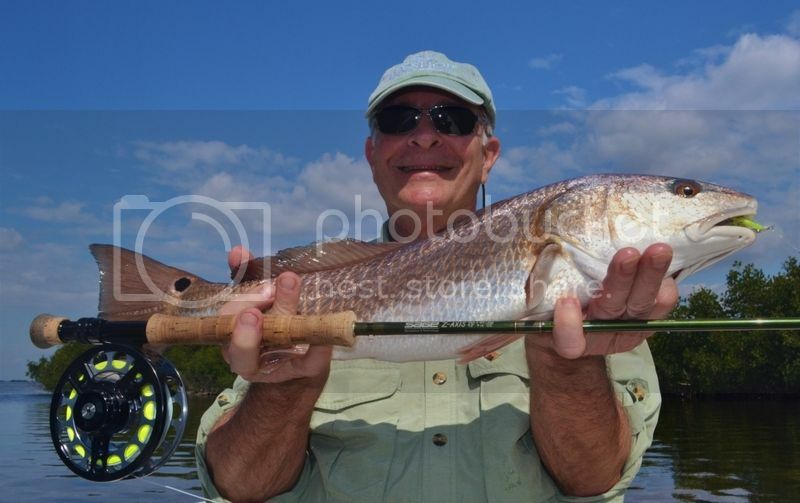 A perfect 24 incher that was cruising right near the mangroves. I'm still seeing lots of snook in there but since I'm rarely fishing with live bait I'm not catching any. I wouldn't be surprised if the front that blew through a week ago cleared out all of the red tide from the Pass. We need to strong winds out of the east for a few weeks to blow this stuff far off shore. This current outbreak is covering a lot of ground.